Home » Podcasts & Blog » Take Control of Your Busy Life: Discover the Secret to Prioritizing Your Time! 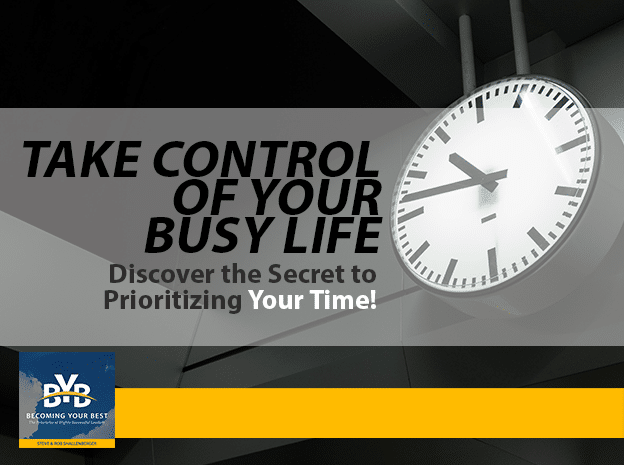 Take Control of Your Busy Life: Discover the Secret to Prioritizing Your Time! Before we began this podcast, we asked our audience what they wanted to hear most from us. While the responses ranged from “how do I stay positive in a slump?” to “how do I handle difficult people”, one of the most frequent questions deals with managing your time and balancing your priorities all while staying sane. Whether you’re the CEO of a Fortune 500 company, a stay-at-home parent, or a student, we all struggle with making sure that our schedule reflects what’s most important in our lives. This is why we’ve decided to share our Pre Week Planning process with you today. This process will help you to transform your good intentions into a reality that will yield the results you want in your personal and professional lives. We challenge you to try Pre Week Planning for the next four weeks to see the radical difference it can make in your life. Choose an accountability partner to keep you honest and download our Life Organizer app or go on our website to www.becomingyourbest.com to find a layout that works for you.